We have to improve our environmental impact and our behaviour towards the environment. It is our responsibility as inhabitants of a finite planet, but also a responsibility towards our future generations. The European Commission is acting in this direction and continues to implement its Circular Economy Action Plan, that is part of its Circular Economy Package. New recycling goals for all municipal waste: 55% for the year 2025, 60% for the year 2030 and 65% for the year 2035. 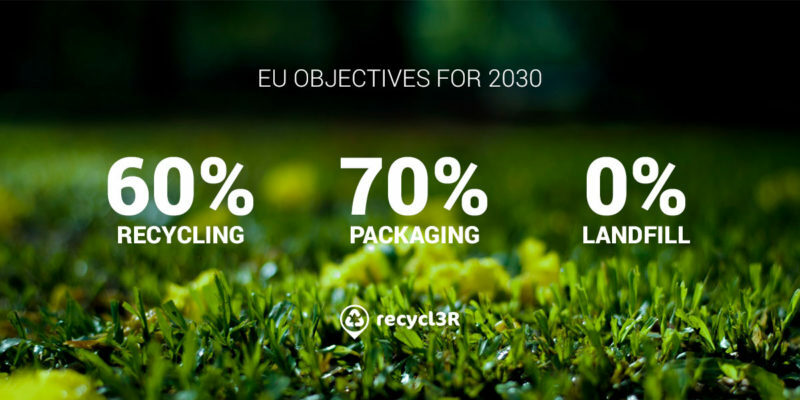 New objectives for all packaging waste: 65% for the year 2025 and 70% for the year 2030 (with objectives for different materials). Prohibition of landfill of all recyclable or recoverable waste by 2030. We have a lot to do and not only consumers must act responsibly, also brands that put products on the market have to work hard to advance together with a common goal: to achieve a more sustainable society. At recycl3R we help brands to become more sustainable and to increase their income by helping their consumers to recycle more and better.